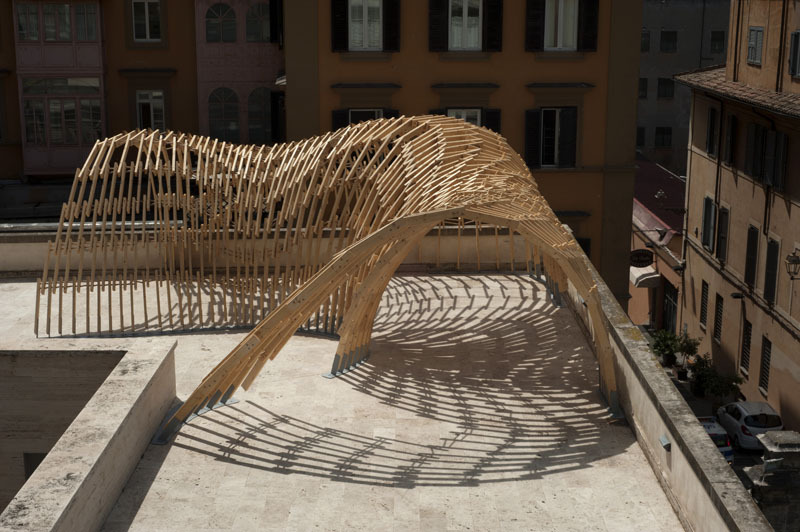 Gradual Assemblies is the result of a 10-week group project realised by the students of the Master of Advanced Studies in Architecture and Digital Fabrication programme together with researchers from Gramazio Kohler Research. 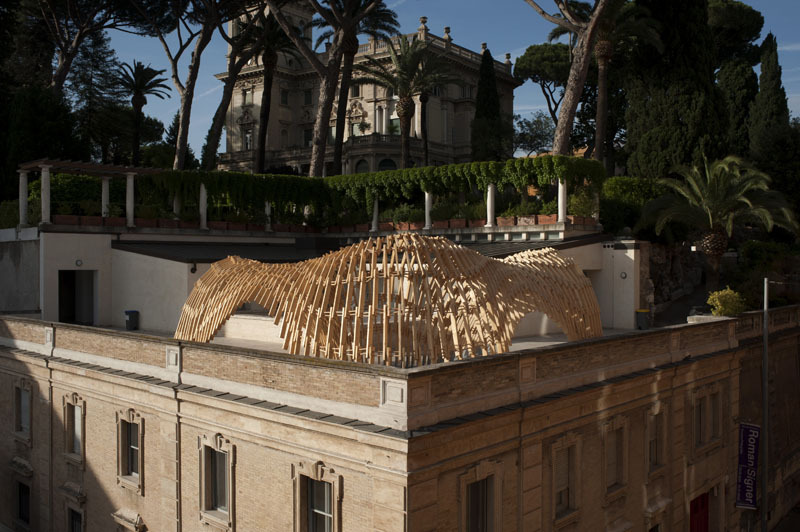 Invited by the Istituto Svizzero di Roma, the brief asked for the design and construction of a pergola structure to protect from the blistering Roman summer heat on the terrace in the southern corner of Villa Maraini’s stately garden. 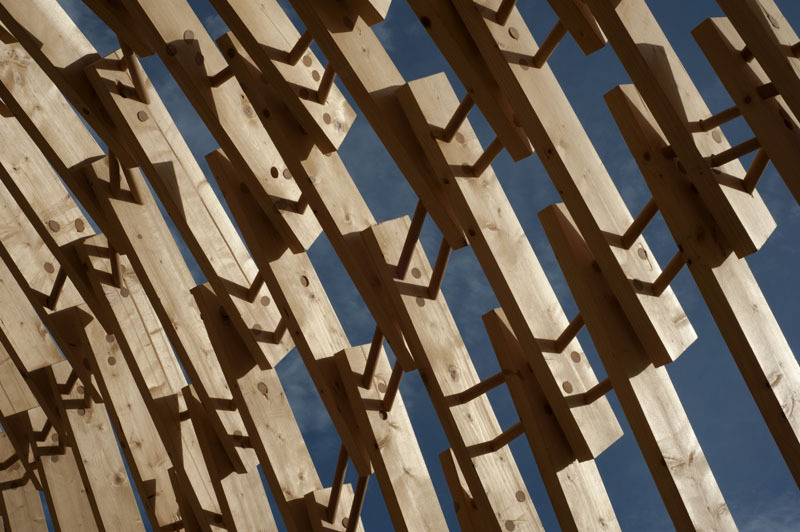 At the heart of the project stands the development of a new timber construction method, where short slats are held in space and locked by wood dowels. 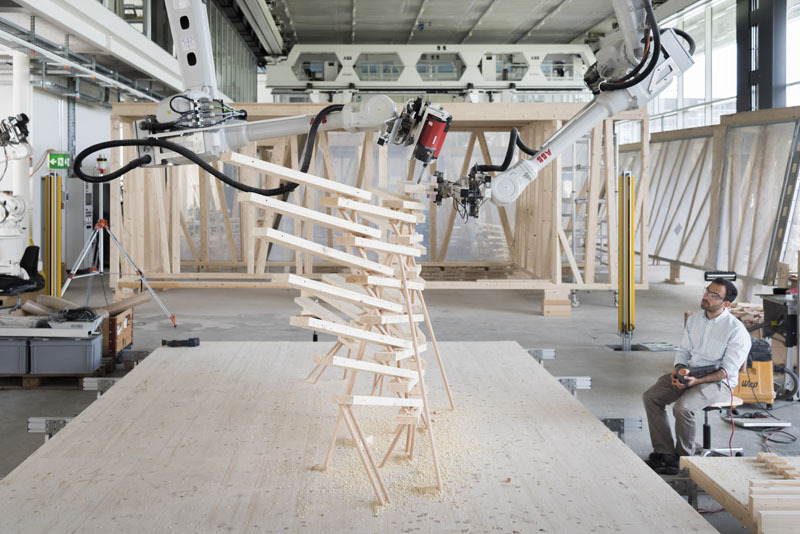 Spatially complex, the process takes full advantage of the potential for cooperative multi-robotic fabrication in the Robotic Fabrication Laboratory at ETH Zurich. 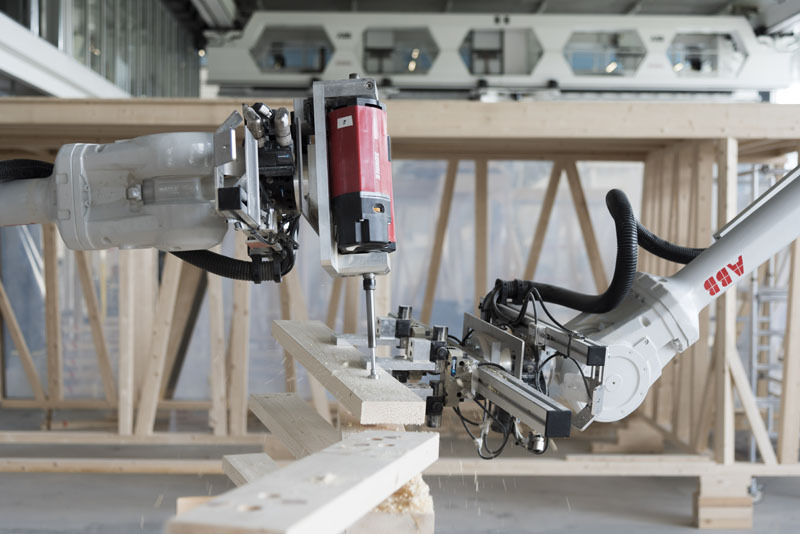 The unique setup of two robotic arms suspended from a gantry allows to position and hold a timber slat in space by one arm, while the other arm drills the holes for the dowels at a defined angle. Taking advantage of the hygroscopic behavior of wood, the dowels are pre-dried in an oven to facilitate their manual insertion into the pre-drilled holes. 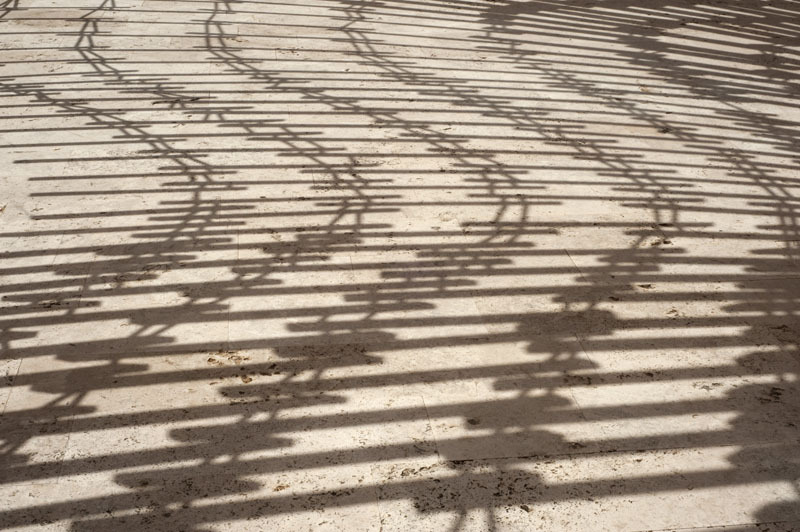 Once moisture is applied, the volumetric expansion maximizes the frictional force between dowels and slats making any additional nails, glue or screws obsolete. Students developed a comprehensive computational model based on a network data-structure. It integrates the iterative design development and geometry generation as well as a stability check and the control of the robotic fabrication process. For Rome, this meant to control the position of 700 slats and the calculation of the position and insertion path of 2700 oriented dowels. Based on the integrated assembly planning 22 modules were produced in the Robotic Fabrication Laboratory at a computationally defined sequence during a period of 19 days. 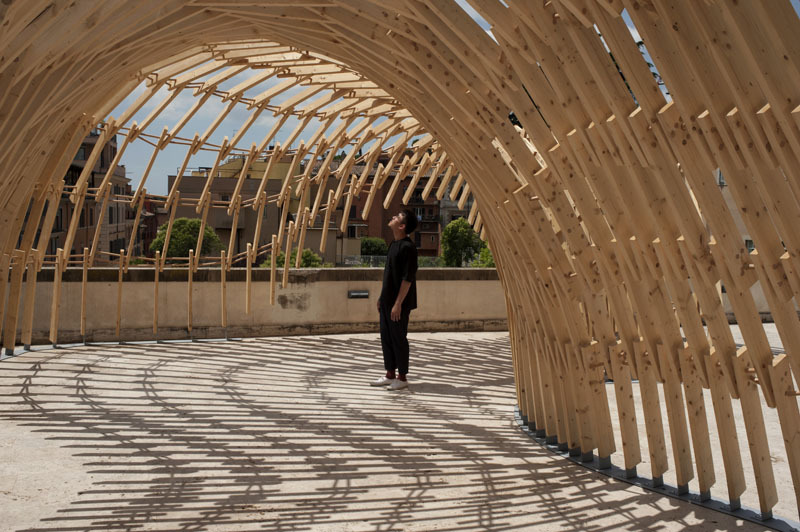 These unique elements were then transported to Rome and assembled within a single week.